Will be tested in the following months c/o UNION Officine Meccaniche S.p.A, two complete co-extrusion lines for PP hollow sheets designed for South American market. The first line have an useful width of 2500 mm, a variable thickness from 2 to 4 mm and an hourly production of about 600 kg. The second line have an useful width of 2700 mm, a variable thickness from 2 to 4 mm and an hourly production of about 800 kg. The lines will be equipped with the most advanced technological solutions, from the extruder to the flat die, to the calibrator at no.3 couples of calibrating plates for a gradual sheets cooling. 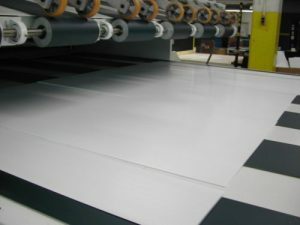 The sheets thus achieved will be used in various application fields, from building to packaging up to the advertising boarding where an exceptional superficial planarity is required.